A few weeks ago, a reader of the site wrote an email asking me an interesting question. He asked me whether or not I owned anything besides what I carry around with me in my backpack. Am I a true minimalist attempting to live life with fewer than 100 possessions at all times or do I actually have an apartment or huge storage space somewhere that is overflowing with stuff? First, let me describe what I do carry inside of my backpack. It’s basically a collection of some clothes (shorts, pants, shirts, underwear, socks), toiletries, sandals and shoes, laptop, Kindle, Panasonic Lumix ZS20 (the perfect travel camera in my opinion), small bag of necessary chargers/wires for my devices, a travel towel, water bottle and a flashlight. Usually, the weight of my backpack hovers around 8-9 kgs (17.6 – 19.8 lbs), although, when I flew from Europe to the US last week, it only weighed 7 kgs (15.4 lbs) when I checked it in at the airport in Bucharest. Now back to the question…does the above list consist of absolutely everything I own in life? The answer is, “no”. I do own more than what I carry in my backpack. While I did start traveling quite soon after graduating from university, before I had time to live in a house or apartment and collect such things as furniture and other normal household items, I have still acquired some stuff from my travels and have also held onto to certain things from my younger years. And the result is three boxes, all of which I keep securely stored in a closet at my mother’s house in the US. Box #1 contains photographs from my baby years up through my childhood and all the way into my early, pre-digital camera travel days, making this one box that I’ll never get rid of. Box #2, which is actually a suitcase, not a box, is full of a random collection of clothes, old journals, a few books and items I’ve picked up during my adventures. These include a silver Tibetan thangka mandala painting, a Pakistani mountain blanket, several wall hangings, a Mexican hammock and an Indonesian sarong. This is the box that, if I do end up with an apartment or house of my own one day, I’ll quickly empty out in order to create my own ‘travel room’ where I can spend some time each day recalling some of the life-changing experiences I’ve had around the world! Box #3 is the box that, every time I come back to the US for a visit, I debate whether or not to toss out. 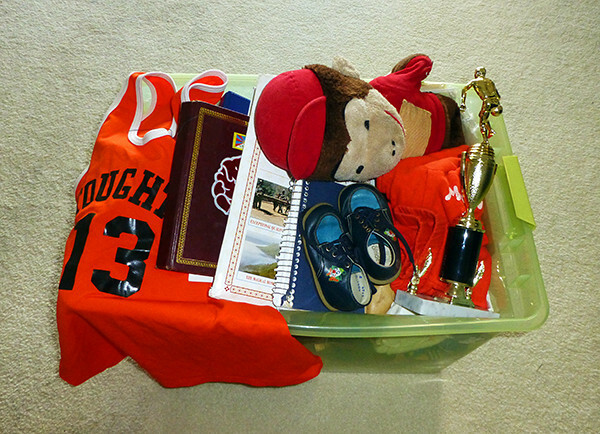 Inside of this box is folder upon folder full of old school papers, from elementary and high school report cards to kindergarten projects to university exam results, as well as old letters, several pairs of my baby shoes and a couple of basketball trophies from high school. Do I need this stuff? Nope. Is it somewhat fun to browse through my school projects every now and then, such as the very cool paper kite I made when I was in second grade? (Which I posted on my Facebook Fan Page a few days ago, a page that I highly recommend you ‘like’ if you haven’t done so already!) Absolutely, and that’s why I’ve yet to throw it all away and probably won’t throw any of it away for a while. And that sums up every possession I have in life. There is no furniture, there is no car, no book collections, no plates and bowls, no television, no beach chairs, blankets or brooms, there’s no closet full of clothes, no toaster oven and not a single coaster or candle holder. Everything I own fits into one backpack and three boxes, and I can’t imagine owning anything more at this point. Of course, everyone’s situation is different and if you’re about to embark on some extensive travel yourself, you may want to store more than what I’ve put away in boxes, especially if you have to move out of a house or apartment before traveling. However, I will state that the less you do have in storage, the easier it is to wander around this world. Not only do you avoid having to pay monthly fees for a storage space (if you don’t have a family member or friend with a large empty corner of their basement), but you will enjoy a greater sense of freedom as well. It is mentally easier to entertain the idea of living or traveling overseas for a long period of time, and to then move around from place to place, if you don’t have to worry about what you’re going to do with box after box after box of stuff. If you only have three boxes, there is no way for your possessions to stand between you and your travel goals. What do you think about possessions? Do you have a lot of stuff stored? If you’re about to travel, do you plan to reduce your possessions before you leave? Oh, that kite!Save the kite haha. This is awesome! I’ve been downsizing for the last couple of years, and as soon as my house sells I’m outta here! I found that watching the show hoarders was incredibly inspirational !! I’m way too young to retire(plus not worth a fortune saved either) so this site is a great resource. Thanks! Hey Quade – I guess I shall meet you out here on the road one day soon! Oh Wow, that’s so great! I’m the Mum now, I have my stuff and the kids’ stuff to worry about, no relatives nearby to help. We’re storing a few boxes in the attic and renting the house out furnished, after we’ve sold absolutely everything we possibly can. Last time, when we were closer to your age and lived at home, it was so much easier! I think the trick is to not accumulate stuff in the first place, we shipped all this out here from the UK, cost us $4000 and now we’re getting rid of most of it. Maybe that’s the reason why I couldn’t start with my plans of traveling. I’m quite of a rat pack and I just can’t get rid of some of the things I own just because of the memories. I think I should start decluttering. Hey Christian – It’s not easy to do but once you start getting rid of some things, it can become quite addicting. Great post, I wish I owned such few things! Side note: Is that a Stoughton MA basketball jersey I see?! Hey Tom – Yes sir, that is a Stoughton, MA basketball jersey! That is where I grew up. Are you from there as well? Ha! That’s awesome, I’m from Weymouth. This blog is so inspiring it’s insane! I want to travel so bad, but i need to grow the balls to just pack up and leave by myself (because no one cares to embark)!!! Hey Tom – That’s great you’re from Weymouth! And trust me, don’t worry if nobody wants to travel with you. Once you get started you’ll be mighty happy that you’re on your own as you will be meeting new people every single day, everywhere you go. In fact, you’ll barely be alone considering how many people are out there traveling the world, in just about every corner of the planet! Thanks again for the response. Yes I’m beginning to think the same. I recently read your post about traveling alone as well (good read). I’m beginning to think that I just need to go out and do it, and reading this blog and seeing your pics makes that even more apparent! As a soon-to-be-on-the-road traveler, I did things backwards. I finished college, started working full-time, amassed a TON of “things” for my apartment, then built my first house at age 23. I have spent the last 9 years in my house gathering things, building a future with someone special, dreaming about different things, and falling prey to “the american dream” of a big mortgage, plans for marriage and kids, and a house overfilled with “stuff.” The job market hasn’t been very steady, I’ve been laid off a couple times, changed jobs a couple times, and the long-term relationship I was building with the most incredible woman I’ve ever met ended June of this year after 3 and a half years. Since then I’ve been doing some serious soul searching and decided that I would sell everything I own, get rid of my house, and travel for a while. I need to purge myself of the past. Things that never came to be. 9 years of things that never came to be. Most everything is gone now, and my plane leaves December 17th. 1-way to Thailand. Sometimes the pain of letting go of the past is unbearable, but I also know that the future holds wonderful treasures. And for now, I’m enjoying the anticipation and unknowns of moving towards my new and exciting future of travel (for a while at least). Hey AJ – Congrats on the life change and I have no doubt that your adventure will provide exactly what you need these days. And don’t worry, you didn’t do anything backwards at all…most people start off following the normal path in life until they realize that they want more than that and time is running out. It’s better to start now than to never get started! OK, now I feel bad for taking up a whole room at my mom’s place with my clothes, bags, and shoes. I just couldn’t part with them! I’m new at this nomad thing, give me a little time. Hey Ava – Haha…don’t worry, it’s not as if I reduced all of my possessions to 3 boxes when I first began traveling. It definitely took some time, many years, to get to that point! I’m big on traveling light, but 8kg is impressive – good work. Having hit up over 50 countries, I have amassed so much memorabilia that I find it difficult to part with. All I’m waiting for now is to discover the one place where I truly feel I can happily lay me backpack to rest. I love getting rid of things. I find it relaxing and sometime cathartic. I also really like helping other people declutter, because they are usually so grateful and feel so much better about the stuff they keep once they’ve actually sat down and made a decision to recycle/give away/sell some things and actively keep others. I have a similar arrangement to you, where I have what’s in my backpack plus a cupboard about 1 metre cubed of things stored at my mother’s house. A challenge (that I’m quite looking forward to!) for me when I go back there around Christmas will be to reduce the stuff in that cupboard even further because my mother is planning to move houses in the next year, and I will likely be in South America at the time, so I don’t want to give her extra things to have to move and worry about. We are certainly lucky to have these family members let us store things with them, because I for one would not be willing to pay for storage, meaning that if my mother wouldn’t/couldn’t store it for me, I would probably have gotten rid of almost all of my stuff in that cupboard. I am grateful for that luxury! Great respect for you to be able to have such minimal possessions and spend life on the road for so long. Do you have yearn to return home though? Probably a stupid question considering how long you’ve been travelling for..
Hey Kan – No question is stupid! But I don’t have a desire to return home at all…while I do enjoy the time I spend back in the US, the longer I am away, the harder it would be for me to return. 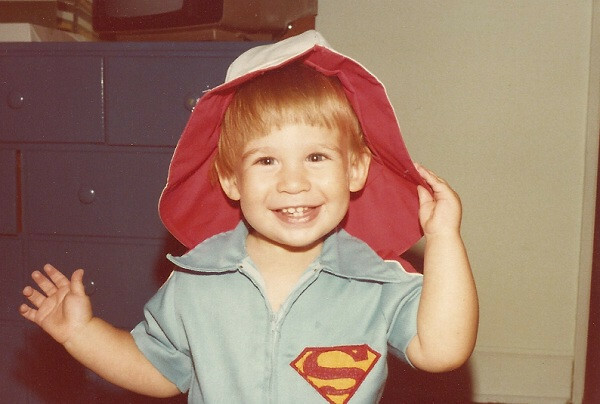 Awww, baby Earl – too cute! Oh, and definitely save the monkey. Hey Bessie – The monkey has been saved! I love that thing and would never toss it away. Superb post that really hits home. I believe this proves we have the ability to cut the strings that bind us to our current lives and jobs and live a more simplistic life. All we need are some essential items, a few bucks and a little motivation, and we can begin to explore the world around us. Very enlightening…thanks again! I’m glad to see you turned my question into a full post! Next can you turn my question about staying in countries longer than the 30-90 days that you get with visa free entry. After that, how about one on the best way to find longer-term housing that hostels or hotels – you know, when you want to stay 30, 45, 60, 90 days in a place it can be very tough to find a place that is reasonably priced. Hey, I’m just wishing out loud here. But this is very interesting. I do have a lot of stuff I can’t stand to part with, namely specialty tools I use in my carving hobby that I don’t want to keep replacing every time I’m back in the states and don’t want to lug around the world with me. I also have a few boxes of books (I did move from an apartment, and I plan to set up another one in the future sometime). 1) Airbnb – many places offer a discount for a month or longer stay, so this is a great apartment rental option. 2) Guest houses – I believe this is also what Earl often does (Earl, correct me if I’m wrong) per one of his earlier posts. Guest house rooms can run a bit cheaper than hotels and give you a little more quiet and privacy than hostels. Usually you can find these by searching online. You can also always reach out to places with a higher day rate and ask if they give weekly or monthly discounts. Many do! I have one possession that does, in fact, hold me back from long-term traveling: my bed. I often read your blog and wonder how you have energy to live the way you do. I find that my quality of life is greatly impacted by my quality of sleep… After a few months away from my bed, I always feel like I need it to rejuvenate my body. How could I possibly let go of it?! Very cute baby Earl pic! My bf and I are in the middle of trying to sell, donate and get rid of as much of our stuff as possible before we leave to travel in March. It’s a hard task; where did all this stuff come from and why on earth did we ever think we needed it?! I hope we too get to the point where we only have a few boxes of stuff to store when we leave. Great post Earl, as usual. I really enjoy your writing and insights. I have been working on getting rid of my stuff. I’ve still got a way to go to be in your 3 box league. However, I’ve had great luck with scanning all of my old documents and storing them in Evernote (I did it myself) and with scanning all my old photos (some of which I did myself on the scanner and most of which required sending the negatives to a service bureau that did it for me. I then put all the pictures on a photo sharing service. If you’d like to get it down to one box, it’s definitely possible. Plus, you get the added benefit of knowing your stuff is safely stored and backed up and not at risk of natural disaster, etc. Keep up the good work. I can’t tell you how much I enjoy reading your posts. I did the same, Lee. I’d held on to all kinds of long-ago school papers. I scanned them before I cut loose from my house, then shredded most of them. Ditto for more recent docs. I scanned old letters, too, but I handed the originals off to the holder of the family archive. I’ve got the docs on my hard drive + a flash drive + cloud storage. 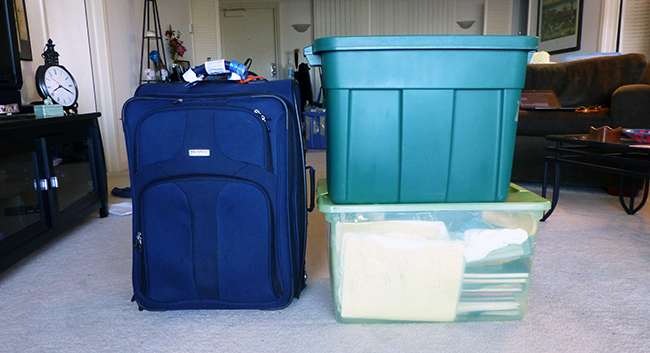 I’m actually back in the states with the express purpose of downsizing my life further and re-packing. When I first left to travel full-time, I left eight boxes behind. Now I’m down to two. This is mostly because I was finally able to let go of the “just in case” stuff (spoons, blankets…you know, just in case I’m not cut out for full-time travel) and convert most of my paperwork and media into electronic formats. I totally agree with you–having just a couple boxes makes it really easy to do what I want. If I decide to settle down someplace, they’re easy to ship. Otherwise, they’re safely stowed with two good friends (one box/bag each) if or when I need them. Three boxes and a backpack is awesome! I would love to be at that point! My problem is that people love giving gifts and I end up receiving so many things on my birthday and christmas. I don’t really want gifts, but when I get them I feel guilty getting rid of them. I’m working on it though, aside from my bed, everything I own would easily fit into a small closet! Thanks for that Wends…it was quite a surprise to be mentioned on that list! I recently sold everything but the one thing I just couldn’t sell. My vintage gameboys. Totally sad I know but those are my babies man! Oh and all those pictures of naked women I own. But that’s another story. Wow! Just like Andi, I am also super impressed. I am always trying to de-clutter and live minimally but after reading this, my tiny bedroom of stuff seems like an entire department store compared to your 3 boxes! I am so very, very impressed! That must be so freeing to have so few possessions!!! A great post, (and not). This is the largest stumbling block I face before I start my life of traveling again. What do I do with all my stuff? It’s a lot easier when you’re young and haven’t accumulated a lifetime of stuff. I’ve got it all and then some. Everything you could possible imagine. Anybody need a crock pot, or a skill saw or a lawn mower or a house full of furniture? George Carlin did a performance on “My Stuff”. You might be able to bring it up on U-Tube. It would be worth it if you want a good laugh. He hits the nail on the head! As I’m 64 (for those of you who haven’t read any of my comments), I’ve collected quite a bunch of “stuff” over the years. Lots of things I’ve brought back from my many travels. Like my blow gun from the Amazon or my Garuda mask from Bali or my Ganeesha from India. I’ve run out of walls and tables and bookcases to show all my “stuff”. Paintings, weaving’s, pottery, photos, carvings, artifacts of all types and on and on and on. There’s going to be a hell-of-a yard sale! Or, if the Mayans are correct; in a couple months, I (or anyone) won’t have anything to worry about anyhow! Earl, I’ve gotta follow up my own comment as I’ve had further thoughts on this topic. I don’t think I’m a “one trick pony” in that I don’t think I want to devote my entire life to just travel. There are several other things that I like to do that require having a permanent place to keep stuff. Decision time again! Oh Boy. Hey Steve – That George Carlin clip is one of my favorites. I actually have it bookmarked on my site and go back to it often whenever I’m in need of a good laugh and a reminder to not collect more stuff! Similarly I have one box back in Perth which lives with my GF’s mum, and one hard drive which lives with my brother. Both however are almost entirely made up of work stuff. I have a few photos from my younger years, but other than that the past has well and truly faded into oblivion. It was hard throwing away memories when we left, but when we really thought about it, all that stuff did was stay in its box and gather dust, whereas the new memories we are making have a much more dynamic way of living. The blog! I have way too much crap I hang on to. I actually have a box that I moved from San Diego to Chicago on 1984, then to Detroit in 1989, then to San Francisco in 1995, and finally to Palm Springs in 1995 where it now sits. In all those years I’ve opened it once. I cannot even remember what is in there. But I feel safe knowing i have it. How silly is that? I have more crap in my office (spare bedroom) closet than what you show…and I have a four bedroom house for 2 of us and a cat. I really need to do a major purge, lol. Hey Scott – Seems like a purge is indeed in order…let me know how it goes! If not, then you either serve finger food or buy plastic ware, which adds to landfills and is environmentally unsound. As a potter/artist, I fret about adding “stuff” to an already crowded planet, even if it is my own. So while I applaud simple living, which I attempt, I ponder how the 100 items lifestyle can be accomplished without the use of other people’s stuff, or is that part of it? For instance, Earl has the use of his mother’s house (no “dissing” intended Earl) and presumably also friends’ places when stateside, and I wonder what would shift if those comforts were not securely tethered in the unconscious during explorations elsewhere. If YOU are the “mother ship” and there is no other, does the 100 possessions philosophy still work? Does another’s long-term storage become one of your 100 things? A curious conundrum. Wonderful! I can’t imagine being apart my two cats and my books. It is amazing what you do and I really admire your determination and envy your self awareness of how to live a life devouted to travelling and following your bliss! Congratulations! Thanks for commenting Iggy and I can imagine that having a pet changes everything! Great post Earl. So often we end up not owning our “stuff”, our “stuff” owns us. Hey Andy – Very true! Oh, see you in a few days! Come to think of it, some of the stuff (read: shoes) I own and really like, are related to another big passion of mine: dance. So yes, I love sneakers, sneakers and sneakers. I also have a lot of other clothes, closets, books, cd’s etc, but I have to say I don’t miss any of those things when I’m abroad and I think that if I’d had to, or would be living a different life then I am now, I could easily get rid of them. Hey Sofie – No need to apologize…it’s interesting to me to read about other people’s experiences with this kind of stuff! For instance: when I go traveling, I don’t mind wearing the same pants for 4 days in a row because I’m thinking: “The people I see now, I’ll probably won’t see again. They have no ide about my wardrobe.”, but going to work wearing the same pants for four days in a row, or wearing the same top to go out every weekend… It somehow feels different. And yes, I realize I like clothes, but I think this might be applicable to other stuff as well. And we usually own those multiple items because it’s easier (than doing the laundry every day, dling the dishes each time you ate something…) and – of course – because we like it that way. Also, it’s weird when you have an apartment that’s empty. Just as weird as traveling around with a bed, two closets and a blender. Beautiful! I love the travel box (box 2) idea! When I graduate and begin traveling I want to have a couple of travel boxes so when I settle down my whole house can be travel themed! I have to say its crazy that you own more than I do, I only have a chest and 2 small bags of things. This was a great post! I’m starting my travels by moving to Taiwan to teach English in one week! I recently donated about 3/4 of the clothes I own to lighten up before I leave. Even the remaining 1/4 is still more clothes than I can fit in my luggage. It’s unbelievable how much stuff I have accumulated over the years. My family wonders why I don’t just take what I want with me and leave everything else behind in my room at home. They are not getting rid of the room, so I could easily leave everything I don’t take right where it is. But I don’t want to do that. 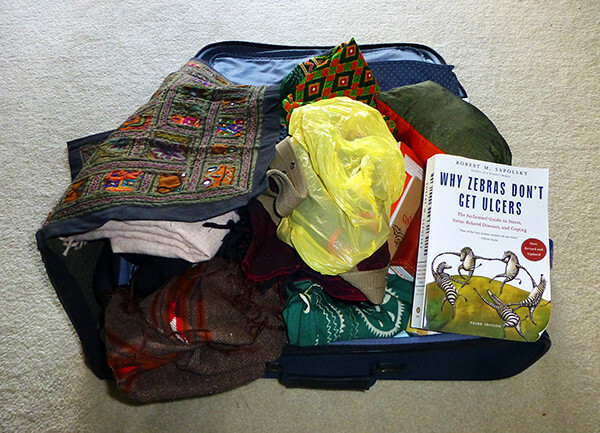 The point of travel for me is to be able to live without a bunch of junk holding me back. And I am moving to Taiwan for a year. Anything I don’t need in the next year is something I won’t need when I finish my contract either. That’s why I’m donating almost everything I own that I’m not taking with me. Because I have no use for it, and other people do. Hey Mike – That sounds like a good strategy to me and donating is always better than just leaving clothes in a box for another year. Have a great flight to Taiwan and do keep us updated as to how your teaching experience turns out over there! a good idea i read somewhere: take pictures of all the items in the box you’re considering throwing away, and then you can have the memory without the clutter. eg, a photo of that trophy is likely to be just as memorable as the trophy itself. (and consider taking pics of all the pre-digital pics too, as a backup, or to get rid of the originals. i’m slowly working my way thru taking pics of various old memorabilia, so i can purge a few boxes. i’ve always fit in a 1 bedroom sized apartment. i’ve gotten rid of my living room furniture over the last few years, as i don’t watch tv, and don’t entertain at my house. i still have too much office/computer/paperwork clutter, but making headway is a slow process. i went on a 3 month trip to europe back in 1991, and a 6 week trip to asia back in 1994. those have been my only extended trips, and i just left my belongings in my apt. for a more extended trip, i think i’d need to downsize much more, which i’m (slowly) in the process of doing even tho extended travel isn’t in my immediate future. That certainly is a good idea for the old photos! I enjoy the freedom of getting rid of as many things as possible… you my friend are taking it to another level!